Century Graphics and Sign is a company that is dedicated to safety, service and quality in the sign industry. 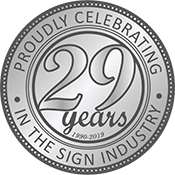 For over 26 years, we have specialized in oilfield and maintenance signage, embroidered and screen printed apparel and custom vinyl graphics, along with a vast array of promotional products. We understand that every detail is important and we are dedicated to providing our customers with a superior level of service. Our in-house manufacturing gives us the ability to monitor our production process and maintain high quality standards throughout and allows us to pass on the cost and time savings to you. We are not limited to the products offered on these pages, we are capable of producing any type of custom sign, apparel or promotional product. Call or email today to see the extent of our capabilities.